All is set for trainees to start work on the 1st of November 2018. NABCO Secretariat on Friday 26th October, 2018 begun the process of placing trainees to module implementation partners and into institutions and agencies. A total of 44366 have been placed so far across the country. Out of this number, 29407 have been placed to Ghana Education Service, 1487 to GIFEC, 5813 to the Ministry of Food and Agriculture, 6574 to the Ministry of Health, 484 to the National Identification Authority, 78 to the Inter Ministerial Committee on Illegal Mining and 439 have been posted to the NABCO offices across the country as Research and Training Corp. 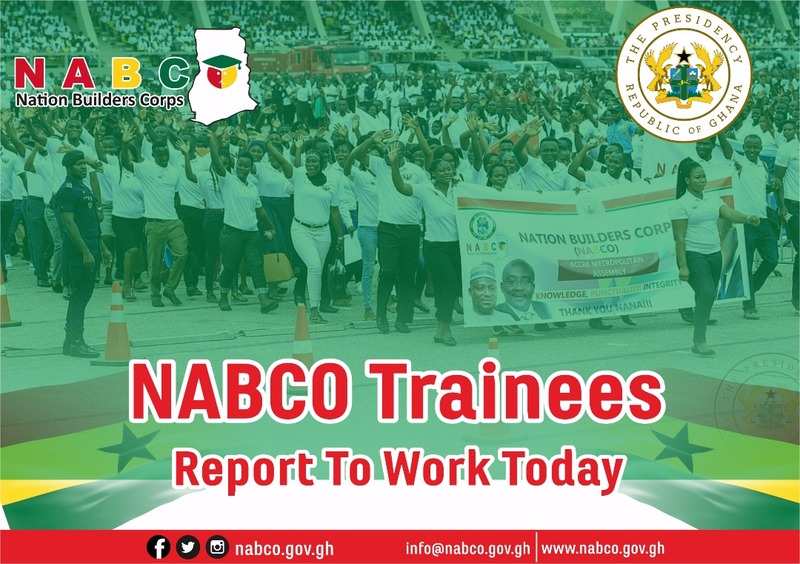 The NABCO Secretariat have observed with delight that, the prospective trainees have shown significant interest and enthusiasm in undertaking this all-important nation building assignment following the numerous calls the outfit has been inundated with. This is a testament of the fact that NABCO has lived up to the very mandate underpinning its establishment which is to inculcate in the nation’s youth, the spirit of seeking knowledge, Punctuality and Intergrity. The NABCO CEO, Ibrahim Anyars(PhD) on behalf of the NABCO Secretariat wishes all prospective trainees the very best in this crucial national assignment and assures them and the nation of the readiness of his outfit to address all their legitimate concerns. NOTICE; TRAINEES STATUS UPDATE – From 1st February to 8th February 2019.